TAG, YOU'RE IT: Which of these tag lines was used to promote the film 'Happy Gilmore'? The price is wrong. Very, very wrong. One man. One golf club. One chance at glory. 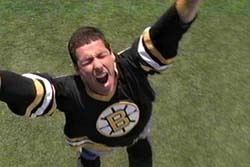 Happy Gilmore is changing the face of golf. Be afraid, be very afraid.